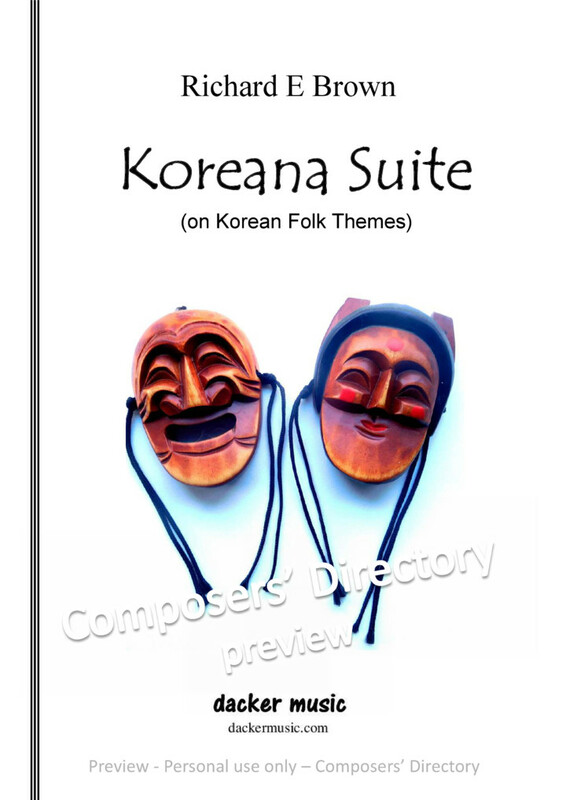 KOREANA SUITE based themes derived from Korean folk songs originating from area around Seoul, called Kyonggido. various styles Korean folk songs, Kyonggido melodies, which built pentatonic scales, most accessible Western ears. 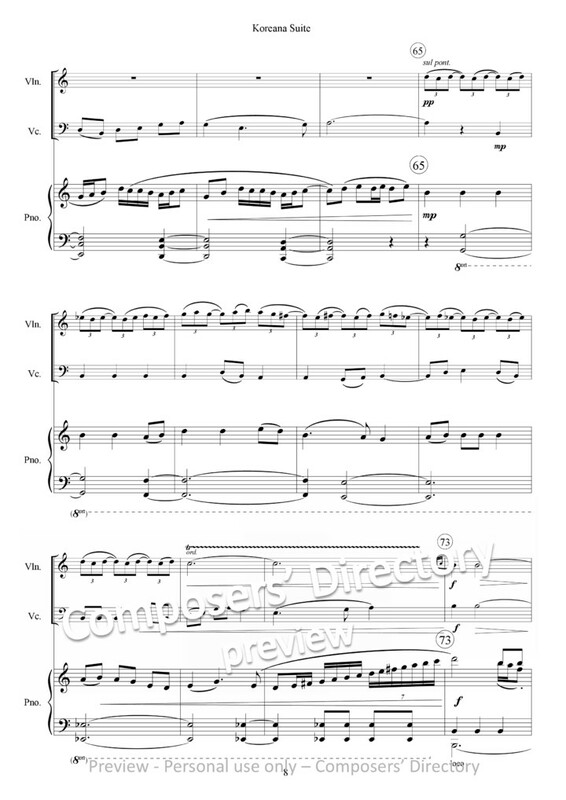 These three movements intended folk song settings, melodies, rhythms, motifs drawn from songs basis themes developed compositionally within more-or-less strict musical forms chaconne, scherzo, fugue. practice drawing thematic material composition from folk melodies practically composition itself. CHACONNE: (Andante moto) chaconne variation form, dating from Baroque Period, which short theme, “ground,” repeated over over while other voices provide variations. this movement, unlike typical Baroque chaconne, theme tied repeating harmonic pattern. harmony varies only theme itself, inversion, repeats. 8-measure ground, from folk song Toraji Taryong (Bellflower Song), played first cello alone, then followed twelve variations coda, giving fourteen repetitions ground. SCHERZO: (Allegro agitato) This movement follows loose scherzo trio form, with trio theme incorporated into reprise scherzo. scherzo theme from Millyang Arirang, sad—but slow--song town Millyang. trio theme adapted from Gok, shaman funeral song, rhythmic figure around which movement built derives from percussion accompaniment this song. FUGUE: (Vivace spirito) fugue subject last movement adapted from Riya, light-hearted dancing tune whose title direct translation. Although fairly strict form, this, like many other contemporary fugues, differs from standard Baroque fugue being less tonally grounded, with answer coming third rather than fifth, avoidance strong cadences. 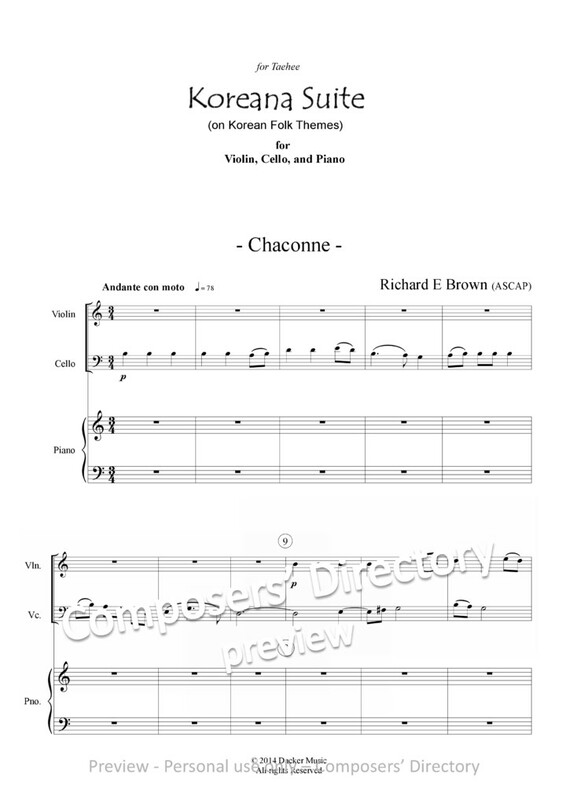 Themes from chaconne scherzo also worked into fugal texture, unifying three movement composition. 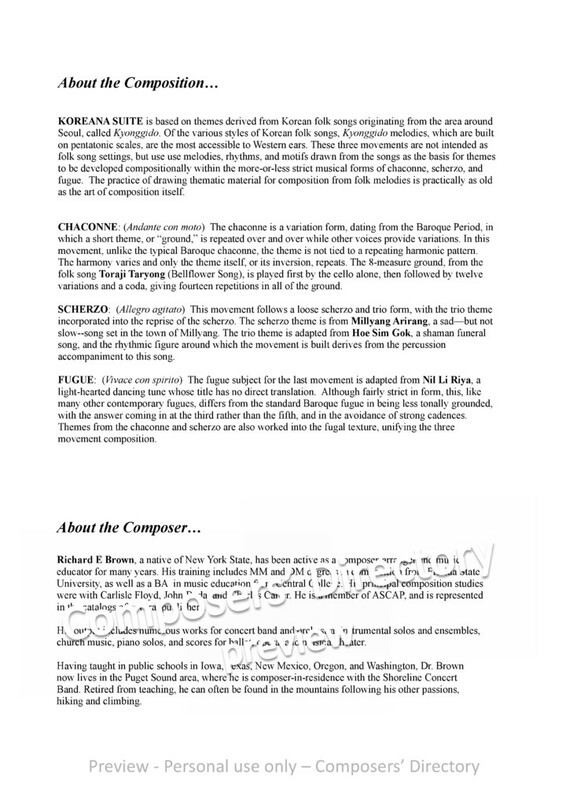 Richard Brown, native York State, been active composer-arranger music educator many years. training includes degrees composition from Florida State University, well music education from Central College. principal composition studies were with Carlisle Floyd, John Boda, Charles Carter. member ASCAP, represented catalogs several publishers. His output includes numerous works concert band orchestra, instrumental solos ensembles, church music, piano solos, scores ballet, opera, musical theater. Having taught public schools Iowa, Texas, Mexico, Oregon, Washington, Brown lives Puget Sound area, where composer-in-residence with Shoreline Concert Band. Retired from teaching, often found mountains following other passions, hiking climbing.   pont. Vln. Pno.          Vln. Pno.     Vln. Vc. Pno.      pizz.                  pizz.     arco   arco             Vln. Vc. Pno.                   Vln. Vc. Pno.